DIY | What, MORE Muffins??? Greetings from the Wintery wilds of Bavaria! It has been a CRAZY month or two, and I don’t know about you, but I feel like I’m just catching up to myself after the holidays. There have been tons of projects in the works, and lots of planning for our latest challenge over at ‘I don’t have a problem, I have a well-rounded fabric stash!’ This month we’re challenging you to create the perfect hat, so be sure to visit the Hats Off Challenge event page for details and to see the fabulous entries that are already coming in! No baking today, but I do have a sneak preview of a Valentine’s Owl Stuffie tutorial I’ve put together for the Valentine’s Day Showcase over at Sew BitterSweet Designs. Melissa has put together ten days of tutorials from some fabulous bloggers and crafters, and I’m lucky enough to be featured on February 6th! 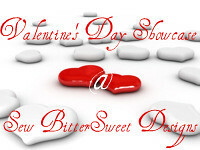 To download a printable PDF version of the tutorial below, click the images or visit http://tinyurl.com/ValentinesOwlStuffieTutorial . PLEASE NOTE- THE PATTERN PIECES BELOW AREN’T TO SCALE! YOU’LL NEED TO PRINT THE PDF TUTORIAL TO GET THE FULL-SIZED PIECES! Thanks for reading- I’d love to see project pictures if you give the tutorial a try!